This is one of my favourite traditional South African dishes. Bobotie has been heavily influenced by the Cape Malay cooking style and is a curry-flavoured mince bake with a savoury egg-custardy topping. It is traditionally served with 'geelrys' (translation: yellow rice) which is made by adding some turmeric and afew raisins to the pot when cooking normal white rice. 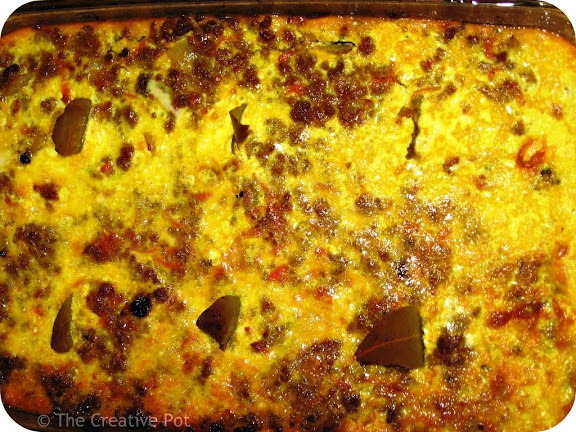 Bobotie is fairly easy to make and I think the ingredients should be easy to find as well. Delicious comfort-food for winter, or serve at room temperature in summer with a nice salad. ground beef. Cook until lightly browned and separated. mashed bread to the meat mixture. 4. Add curry, sugar, salt, pepper, turmeric, vinegar, raisins & chutney to the beef mixture. the mixture. Bake for 30 minutes. Remove from oven. minutes, or until the egg-misture has set and is golden brown on top. 6. Serve with 'geelrys' and extra chutney.